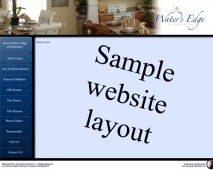 If your company does business, it is a great possibility that you need a website. Even if you do not think you need one now, you should reserve your domain name so that when you are ready, you have the best representation of your business. Not only will Your Computer Solutions help you reserve your domain name and get your email up and running, but we will custom-build an attractive website that will represent your company with quality and creativity. Below are a few of the designs we have published. If the site is published on our server you will be able to click on it and view the site directly. You will find most sites have four main components. The first component is the header. This is the first thing the person viewing the page sees. It should be attractive and eye-catching. It should also identify your company name and/or website address. The second component is the sidebar. This should be attractive but easy to read. This is where you put information that you wish to appear on every page. Usually phone numbers and address information, along with a photo or other eye-catching image is placed here. The third and most important component is the content pane. This is where you put the information you wish your viewer to read. Be sure you organize your topics well and each page is easy to understand. The final component is the footer. This is where you have your copyright information and link to the hosting and web designer. Each website also contains a menu navigation system that allows the viewer to interact with your site and select the information they are interested in viewing. This should be easy to read and well organized. A website is not going to make your company money in a week or a month. Instead, a website is your voice when you are not available by phone or in person. It is a tool to use to answer the most common questions that you are frquently asked. As you review the sites below, imagine how your company could be represented and what you would want to your customers to know. 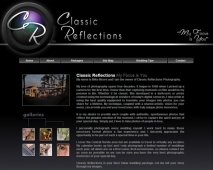 Classic Reflections is a website featuring the photography work of Mike Moore. You can visit it at http://www.weddingsbymikemoore.com. Mike photographs weddings and does great work. His site features a gallery of images which featues his artwork and a custom logo design. This is my site. As you are on it you can tell I don't have as much time to work on my site as I do on everyone else's. This site features a rotating topbar banner and our new seo module and a custom logo design. 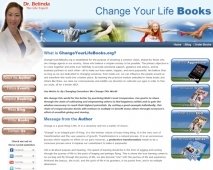 Dr. Belinda Liau is an author and public speaker who runs an acupuncture clinc in Orlando. She needs a nice looking site. 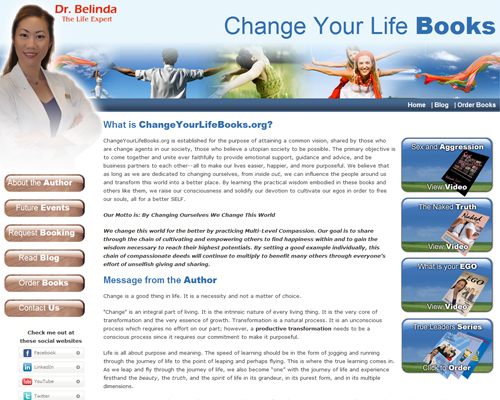 You can visit her site: http://www.changeyourlifebooks.org and find out about the series of books she has written. Her site features a right side bar and embedded videos. It also links to a number of social networking sites and has a custom custom image profile embedded into the site. Jeff Ramsey is the owner of a construction company in Orlando. 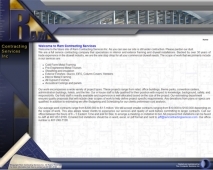 He has a website at http://www.ramcontractingservices.com/. His site feature rotating topbars and a gradient bar that streches with the window size. This is the best restaurant in town. She needed a website to get the public to know about her place. You can visit her site at http://www.marayarestaurant.com/. 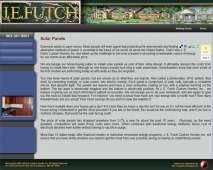 Her site features a number of popup image galleries a left menu sidebar and a dinner menu. Ralph is the ultimate Sales Penetrator. He wanted a site to teach sales professionals through video blogs and reviews. His site is at http://www.salespenetrator.com. This site features a rotating top banner, rotating side bar logos, embedded video and a security module which allows for users accounts. SolgamesUSA is a charity which provides computers to non-profit organziations. Thier site is http://www.solgamesusa.com. 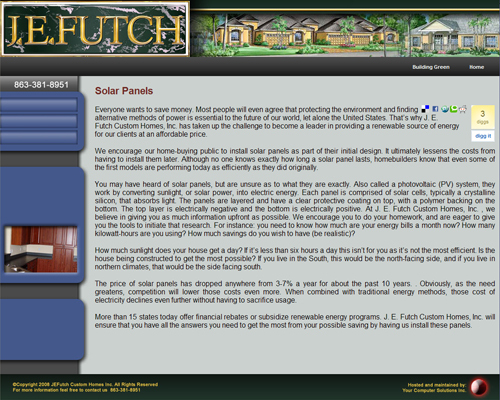 This site features a menu sidebar and a news module. Natures Estates was a development of homes in Georgia. They wanted an overhead view of the land with sub pages for each plot of land to be purchases. After all the plots were sold the site was changed to a community site. The Metropolitan Orlando Urban League is a great organization that helps the Orlando community. Their site is at http://www.cful.org/. 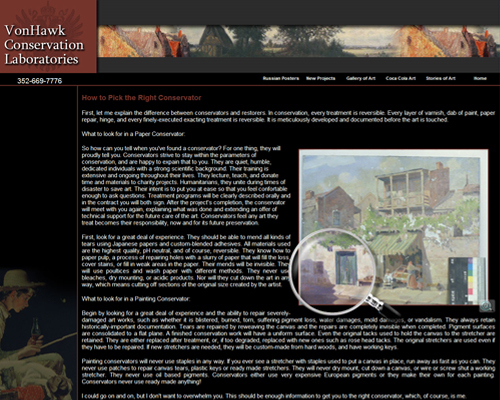 This site features a menu sidebar, popup gallery pages and a rotating image flip. 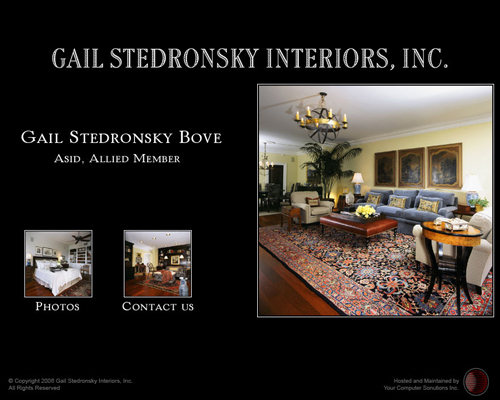 Gail Bove is a top notch interior designer. She needed a site to display her skills. Her site is http://www.gailinteriors.com. 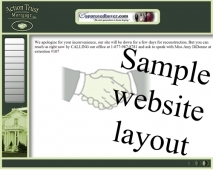 This site features a roll over gallery and a keep it simple template design. 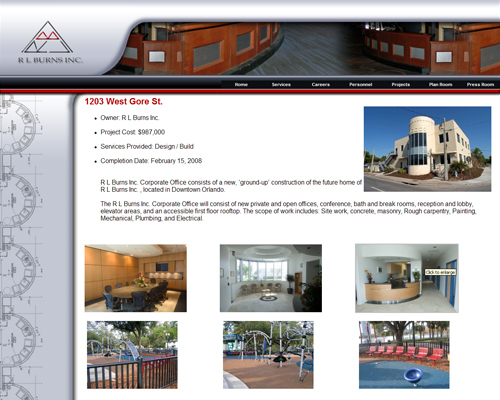 RL Burns Inc. is a construction company that performs large scale jobs in Orlando. Thier site is http://www.rlburnsinc.com/. This site features a rotating topbar, popup image gallery with text overlay, user management, security module, and document storage system. 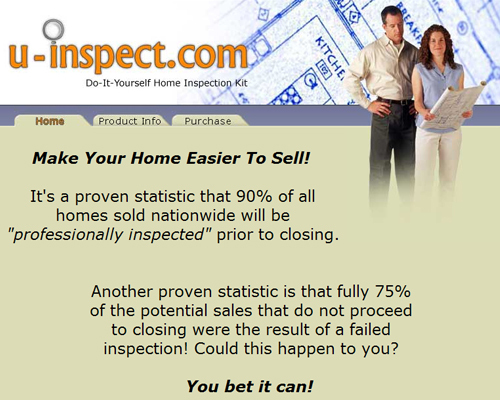 U-inspect was a site that was developed to sell information on how to prepare your home for sale, as well as save some money by performing your own home inspection. 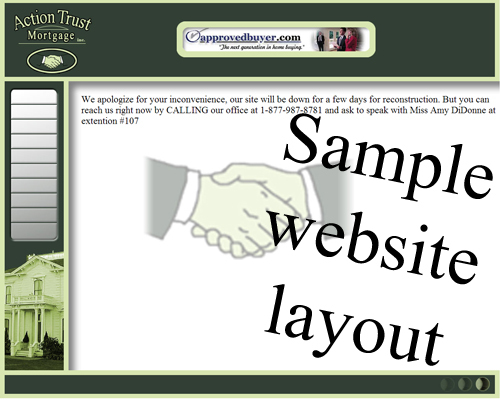 The site was developed but the client never produced the information that was supposed to be sold. This site featured clean cut design, one item shopping cart, and personal photography images. 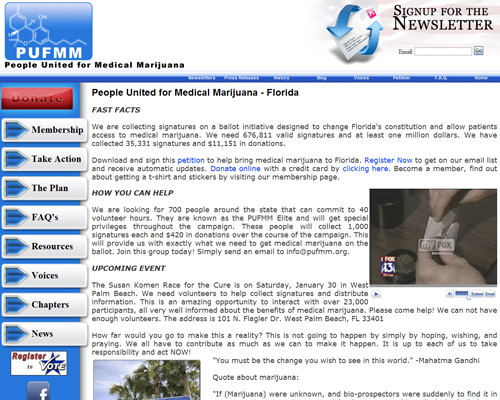 People United for Medical Marijuana is a political action commity working on a ballot initiative designed to allow patients access to medical marijuana. They needed a site to properly represent their cause. Their site is http://www.pufmm.org. This site features a sidebar menu, embedded google calendar, embedded video, social networking links, and custom logo design. YCS Printing is the printing division of Your Computer Solutions Inc. We need a site that allowed for custom designing of graphics on the fly. The site is http://www.yctp.com. 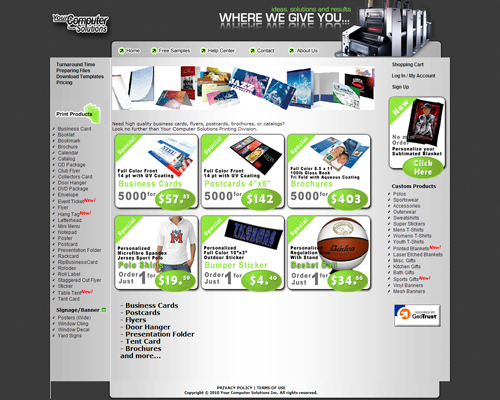 This site features flash rotating images, advanced design engine, and fullfillment based shopping cart. 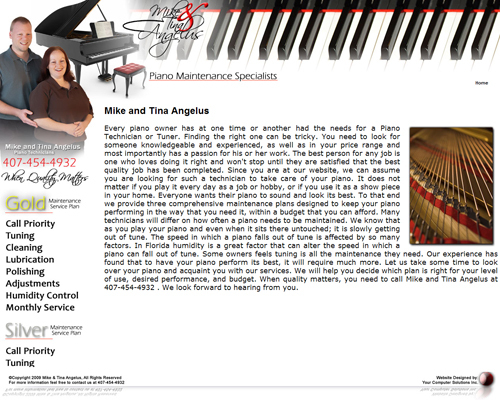 Mike and Tina Angelus are professional piano technicians in Orlando. 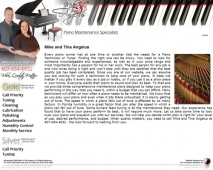 They needed a website to promote their piano tuning business and develop a maintance program. Their site is http://www.mikeandtinapianos.com. 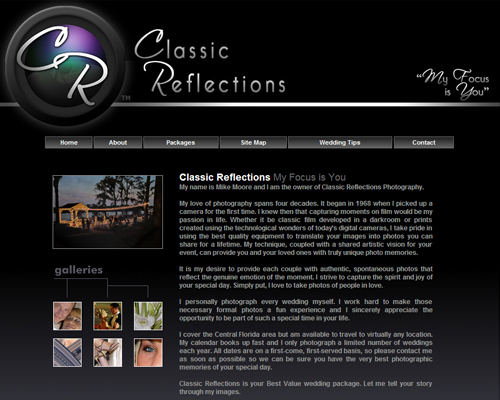 This site features repeating topbar image, image map sidebar, custom logo design, and personal image photography. Victorious Secret is a guild that plays the game World of Warcraft on the Haomarush server. They needed a site to commuicate with a large group of people. Their site is http://www.vsguild.com. 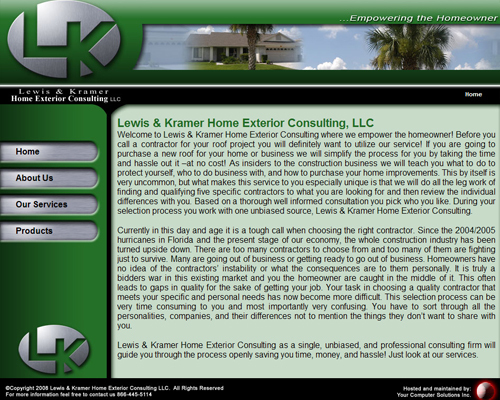 This site features a custom opening page with rotating landing pages. 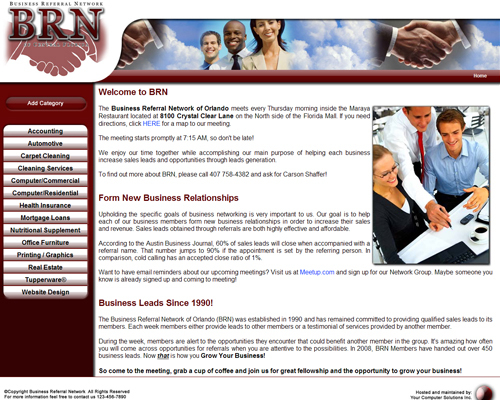 Business Referral Network is a lead group that meets in Orlando. They needed a site to promote their meetings and advertise their members to the public. 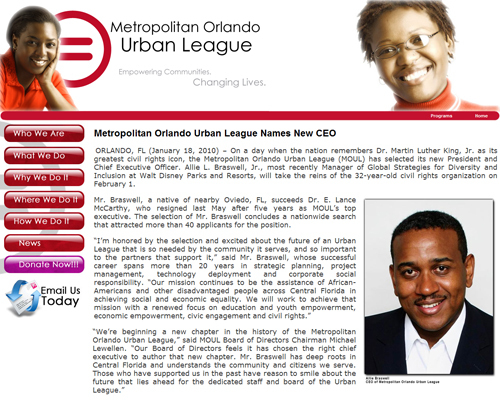 Their site is http://www.brnorlando.org. This site features custom sidebar menu with auto sorting and a custom logo. Transforming Productions holds nightlife events throughout the state of Florida. They needed a site to quickly edit events and promote vendors and entertainment. Their site is http://www.tformpro.com/. This site features social networking intergration, menu sidebar, custom logo design, and many popup image galleries featuring thier past events. This site was designed for the sole purpose of seo pushing. Here we would publish articles that would promote green building materials and other positive stories about construction. We then provides links and text to a preferred contruction company so it would be ranked by google. The additon of blogging and social network links helped to get a large number of readers very quickly. The site now appears on page two of the google listing but pushes the client site to the first page of google without any paid advertising. This site was built under a low budget of $1500. The client was approached by a number of seo companies about how they could be doing better and faster. Not being computer techs the clients were not sure what to believe. I encourged the low cost and slower approach. Another firm explain if you did not put at least $15,000 into your webpage you were wasting your money. The client got a bigger site with lots of fluff content that the website company provided for $15,000. They they paid $1500 a month with google advertising and found they were receive $1600 a month in business from it. After six months the company went belly up and the ex-client explained to me the story of how it happened. I prefer to sell a lower cost solution and slower path so that I can ensure my client still has capital to run their business as well as make improvements to their site when the increase of traffic can use it. Alex vonHawk is an amazing woman that restores artwork. Her lab is a joy to visit. Her site is http://www.vonhawk.com. This site features popup image galleries, rotating topbars, rotating sidebars, and a magnifing glass which would show the difference from damaged and repaired artwork. 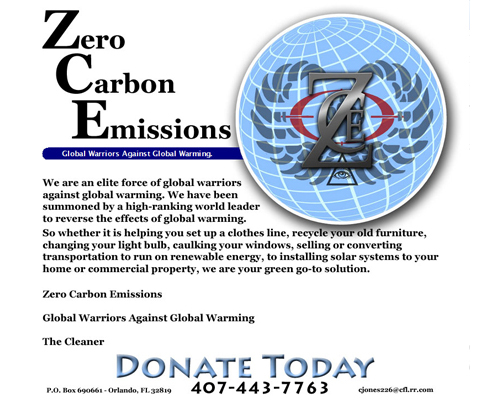 Zero Carbon Emissions is a client that wanted to help the enviroment. 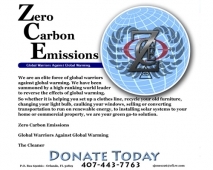 Thier site is http://www.zerocarbonemissions.net. 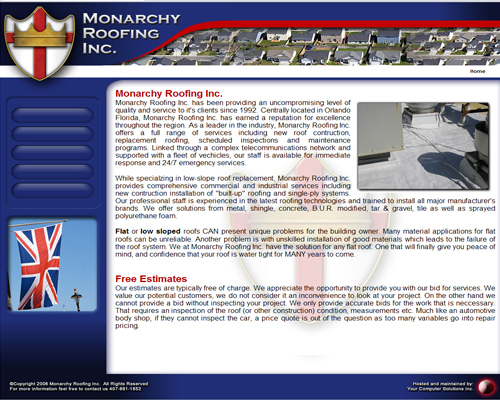 This is an example of a simple flyer page. Karen is not only a terrific performer but an acomplished writer. 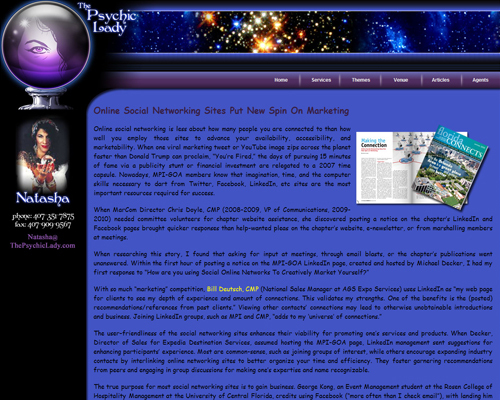 Her website ishttp://www.thepsychiclady.com. This site features a rotating image sidebar and an article module which is used to promote articles on facebook and other social networking sites bringing traffic to her site. Beach Hut is a manufacture of Postcards and Souvenirs in Florida. Their site is http://beachhutfl.com. This site features a catalog for clients to review their products. DruidQueen is a writer that is working on a fantisy novel. 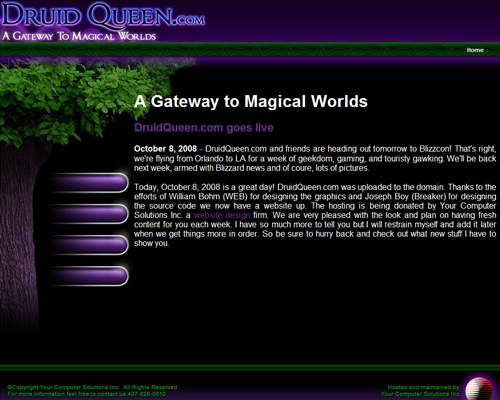 Her website is http://www.druidqueen.com. 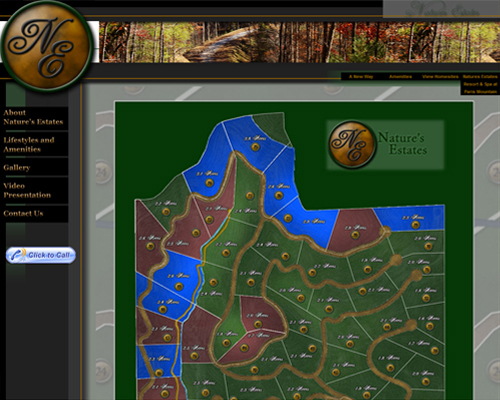 This is a basic site layout. It is being used to hold the domain for a book opening in the future. The domain is also used for a user secured wiki and forum for the writer and contributors. 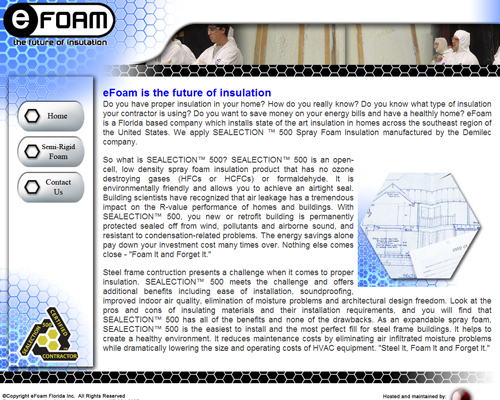 Efoam is a new type of insulation that is used in contructing a new home. Their site is http://www.efoamfl.com. 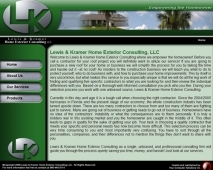 This site features a static template and low cost flyer pages. Carson Shaffer needed a website for his computer firm. 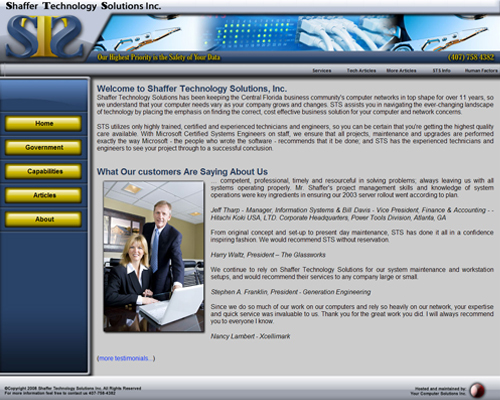 His site is http://www.shaffertech.net. This site features a rotating topbar and a sidebar menu. 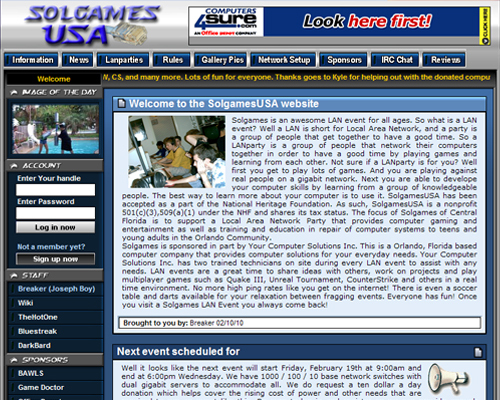 SolgamesUSA holds LANParty events once a month and needed a website to keep all the information in one spot. Their website is http://www.solgamesusa.com. 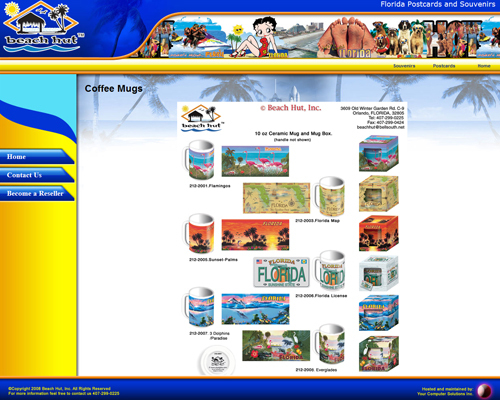 This site features a java html scroller, ad banners, and user account interface. 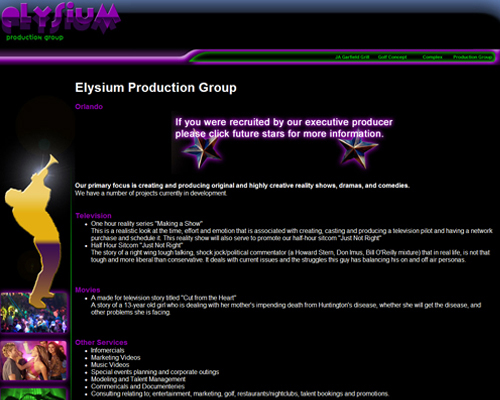 Elysium was a client that was planing a night club complex near Universal Studios Florida. After the promo site was built to create interest in funding the project, changes in the availablity of the land shelved the project. 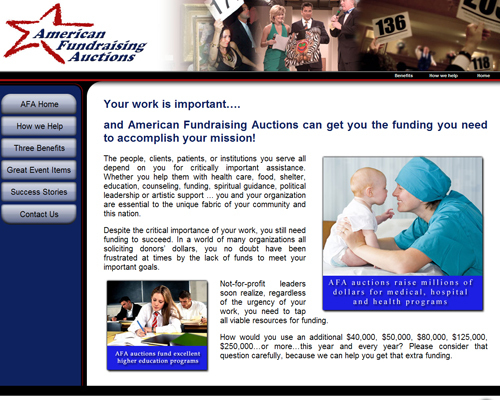 American Fundraising Auctions helps raise money for charities all across the United States. Their site is http://www.afauctions.net. This site features a rotating topbar and a menu sidebar. 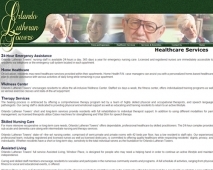 Towers Home Care was a adult care facility in Orlando that needed a site. 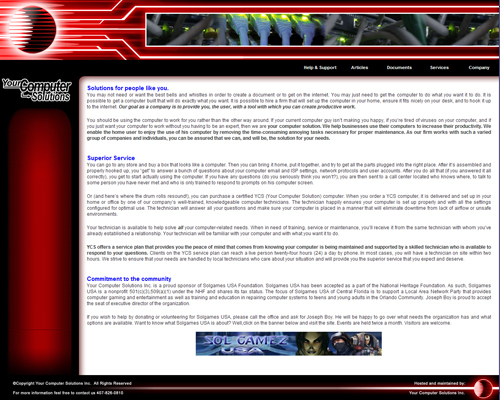 After a number of years the site was revised and replaced. This site featured a rotating image topbar and custom logo design. TNT Stairlift needed a site offering medical grade mobility options for seniors. 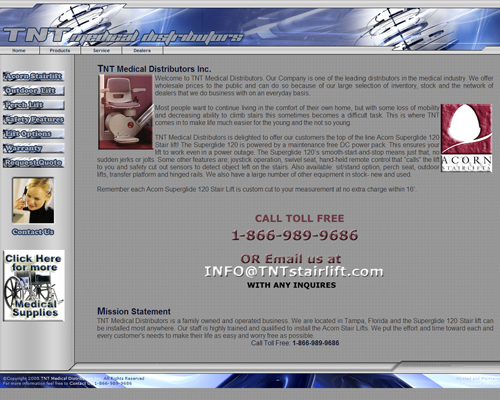 Thier site is http://tntstairlift.com. This site featued streaching seperation bars and sidebar menu. 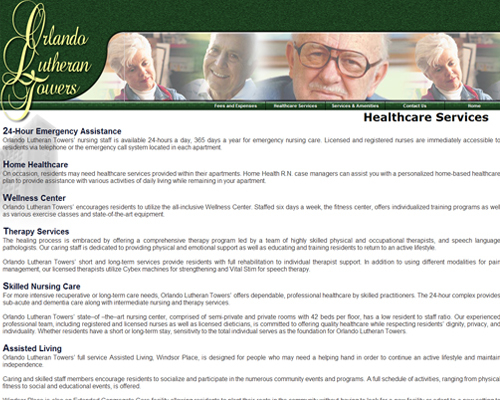 Orlando Luthern Towers needed a site to match their current marketing and attract wealthly seniors. After a number of year their marketing designs have changed and the site has been redesigned. This site featured a rotating topbar and removable sidebar. Monarchy Roofing needed a site to promote their commerical roofing company. After major changes with the ownership of the company the site was redesigned. Watersedge was a retirement community in South Florida. We designed a custom layout for their website that featured rotating topbars that repeated from right to left and scrolled off the screen. It also featured a gradient sidebar static menu. Action Trust was a mortgage company in Longwood. They needed a website template that would allow for banner advertising on the top and a sidebar menu. 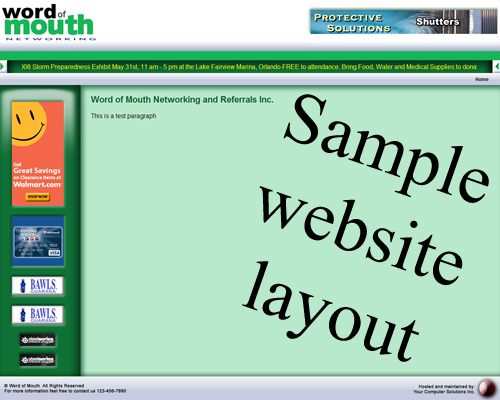 Word of Mouth Networking needed a graphic logo design, and a website template that featured an advertising banner for revenue production and sidebar ads with varied sizes. This design also featured a scrolling html bar. 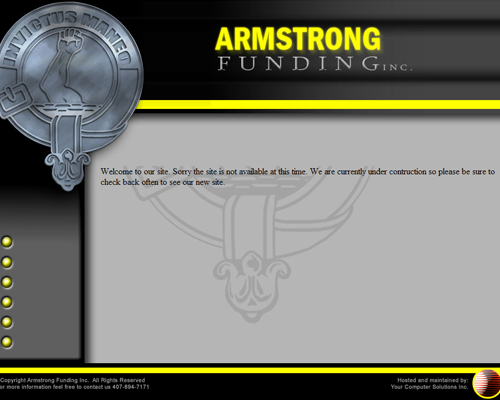 Armstrong Funding was a great mortgage company for a number of years. He needed a new design that matched his old high school. 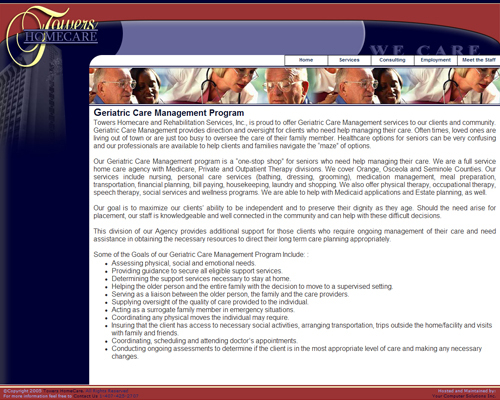 The layout featured a custom logo design. 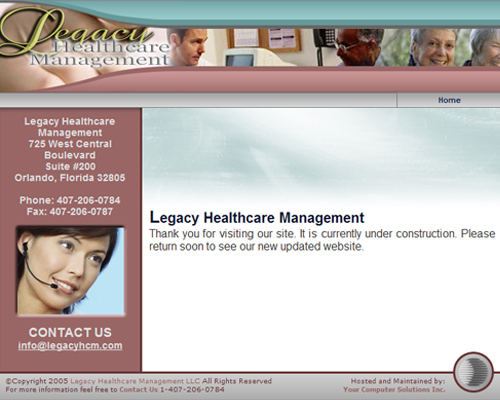 Legacy was a management firm that needed a website design that attracted senior health care firms and featured a rotating topbar.